New board games for the holidays from small companies. 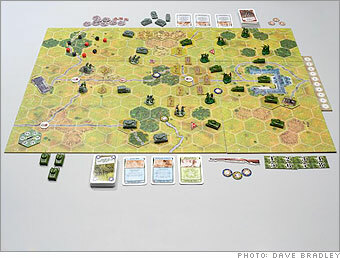 Some 216 plastic pieces represent artillery crewmen, infantrymen and military vehicles in Tide of Iron, a new WWII game from Fantasy Flight, based in Roseville, Minn. Tide's tactical scenarios - figuring how to protect ten tanks as they move through enemy territory - are loosely based on battles that raged in Europe between the Allies and Germans in 1944 and '45.